The ultimate wear-resistant ceramic lining for applications exposed to coarse ore and extreme impact. CorroCube is a high-performance abrasion and impact resisting lining system ideal for high-impact, high-pressure applications in which ceramic tile may not have sufficient structural resistance, and high-performance rubber may not offer the required wear life. 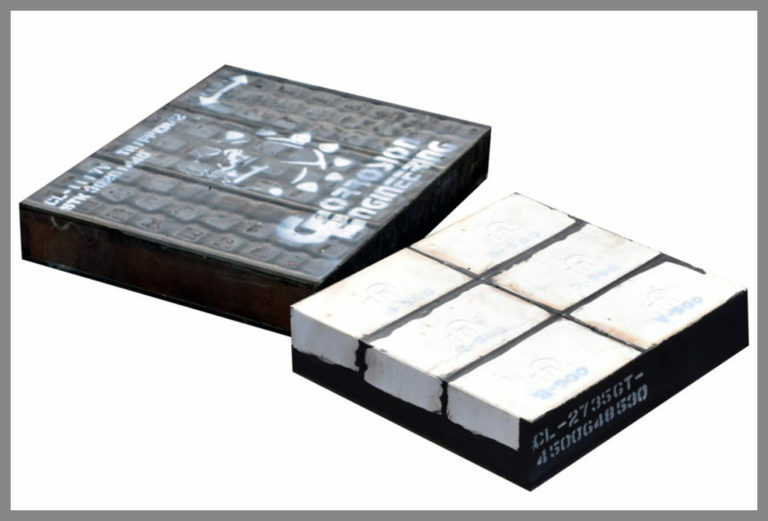 Corrosion Engineering’s exclusive bonding system ensures that the ceramic cubes do not disbond from the rubber, ensuring long and effective liner life. Several ceramic formulations are available depending on the application. In extreme applications, CorroCube liners can be installed in a matrix of abrasion resistant (A/R) steel plate (up to 500BHN) to provide structural support for the ceramic/rubber matrix and provide exceptional wear life where competing products cannot. CorroCube is the most cost-effective solution to coarse particle and high-impact wear in the toughest material processing applications with high material throughput. Corrosion Engineering will custom design and engineer CorroCube to perform optimally in your specific application. Our application specialists can select from a variety of ceramic compounds specifically engineered for wear applications. Corrosion Engineering’s premium grade ceramics have consistently outperformed most of the commonly used wear-resistant materials employed in material handling systems for dry substances, slurries and dust laden gases. Our high performance wear ceramics will outlast materials such as carbon steel, Ni-Hard, stainless steel, abrasion-resistant steel (AR) and others by a factor of 10 to 30 times. This translates into longer equipment life, lower maintenance costs, and reduced process downtime resulting in higher productivity. CorroCube is manufactured with a variety of premium proprietary blends of wear-resistant rubber compounds combined with our exclusive manufacturing process that ensures a bonding of liner components that exceeds the tensile strength of the rubber. This superior bond strength ensures that the liner will remain intact with the inability for ceramics to dislodge from the rubber matrix, offering reliable wear protection through the complete life of the liner. With nearly 40 years of development, CorroCube is engineered with the optimum combination of structure, energy absorption, bond strength, and abrasion and impact resistance. Custom design features are incorporated in order to maximize your specific application’s performance. For extreme applications, the rubber and ceramic materials can be placed in a fabricated structure consisting of a perimeter bar, and, when indicated, internal reinforcing bars to provide additional structural rigidity and protection incorporated into the liner. CorroCube wear liners perform extremely well in applications exposed to large coarse ore, high impact, and severe abrasion. CorroCube liners are ideal for impact plates, feed and discharge chutes, coarse ore feeders, wear bars, dead bed bars, screen feed and distribution chutes, slurry boxes and launders, and skirt board liners. MagCube® and MagTile® are magnetic ceramic wear liners that offer the same superior wear resistance of CorroCube® and CorroTile® but with easy magnetic installation. VibraCube® is a proprietary ceramic-reinforced inflatable liner ideal for maximizing availability in transfer applications with severe wear and material build-up issues.